I am willing to bet that grip is the weakest link in the photo production chain, not only in countless private photographers’ own studios, but also in many major rental facilities. Somehow photographers, and studio/rental managers, are just not willing to invest as much money and care in stands, booms and related grip stuff, as they eagerly doing with camera and lighting gear. Cover image: In order to suspend French model Laetita Casta for this advertising shoot for diamond.com in a life size “spyder net”, high above a 4×6′ Broncolor Cumulite, itself rigged up on 2 massive crank stands, this set required a great amount of solid and reliable grip. Any failure of the equipment would have resulted in catastrophe. (image by Markus Klinko). A big mistake in my opinion. First, when it comes to great lighting in photography, the angle, placement and direction of the light is actually a lot more important than what kind of modifier or flash brand you use. Many photographers have expensive gear, but have no way to position it properly, and therefore can not reap the full benefits, no matter how good a light they use. It is also a lot faster, safer and more convenient to rig on top notch, well maintained and appropriately chosen gear, and makes the job a lot more fun. In film production, where lighting crews are teams of specialized, trained professionals, this slacking on proper grip does not occur. I have personally always been very keen on great grip and rigs. Earlier in my career I spent a lot of effort and money to design elaborate custom camera rigs and brackets. During the transition time from film to digital, in the mid 2000s, there were no better solutions than adjusting existing cameras to best fit the new technology. Luckily for me, this is no longer necessary nowadays, as excellent products are available. In late 2003, I designed several custom dual hand grip and 10x viewfinders for my Fujifilm GX680III and Mamiya RZ67 cameras. Adapting heavy film cameras for handheld shooting with digital backs was a challenge, but served me well for nearly 10 years. The heftiest of them all: the 12′ Manfrotto Super Wind-Up Steel, equipped with large casters and ample load capacity of 176 lbs. This stand is used to support my all time favorite boom, the Manfrotto 425B Mega. Ideal for heavy modifiers such as the Broncolor Flooter, a large fresnel, and to bring larger Broncolor Paras, such as the Para 222, in tilt positions. The fabulously convenient Matthews Minivator II Geared Stand, and the smaller, but very clever KUPO 3 Section Wind-Up Stand. although Manfrotto also offers a stellar version of this. The combo of a mid -size wind up with an offset arm is ideal for key lights that are rigged right above camera, allowing to stand conveniently immedatly behind or directly under the light, and offer just enough space to avoid having to use a full boom. When I choose a shorter boom, I like my Matthews 7′ Mini Matth. Both Matthews and Avenger have several great roll stands, and I find it most useful to have a few of each, as the different type of legs allow for overlapping in crowded situations much better than when only using one type of stand. 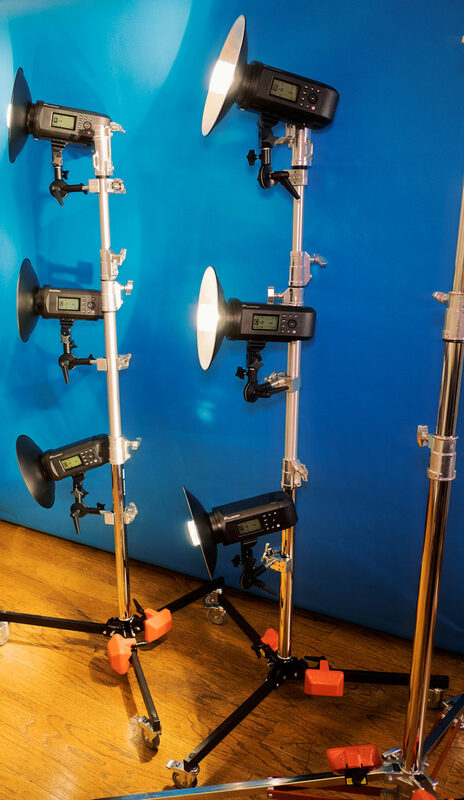 The Avenger Roller Stand 34 is a great stand to rig multiple lights in rows. This is where the Flashpoint XPLOR H1200 and H600 PRO remote heads are particularly ideal. They can be very precisely rigged with a combination of Matthews Super Mafer Clamps with Baby Pins and the Westcott Tilter brackets. Avenger 34 Rollers become light trees with the help of solid clamps and brackets. I find the Matthews Junior and Senior stands ideal for backdrops and mid size lighting fixtures. To complete this list, let’s not forget about the KUPO rolling bases. I use both the Runway Stand Base as well as the 340 Roller Stand base. Both can accept various types of riser, tall and short and are also great to use for rigging larger scrims in pairs of 2, and allowing the scrim to be rolled around as needed. Well, the company’s ad slogan might be a bit creepy, but the KUPO spring- locked turtle base is a winner! The base can be opened and closed easily with one quick wrist movement without any effort. Avenger risers are a great choice to go along with the KUPO bases, but there are several other great riser options including Kupo’s own, and Matthews, for example. Another type of modern design C-Stand design I like to use comes from Flashpoint, a 10′ stand that includes a grip arm and 2 Gobo Heads. The Flashpoint base has the advantage on uneven terrain, as the legs can be moved individually to the desired angle. A great travel companion, and surprisingly sturdy, my Manfrotto Nanopole stands are excellent light weight, foldable stands. They work great for small lights such as my Flashpoint EVOLV with smaller attachments. A specialty item that I find incredibly useful is the Matthews Matthelinis 6″ Jaw clamp. It is a life safer when nothing else works, and can be used in unexpected situations. I truly tried them all, but the many possible combinations with RRS rails, flash brackets and related accessories are by far the industry best. I mostly use the large Flash Ring with various orbiting mounts, but also like the lighter Hoop variant as well. The build quality and smooth finish of all RRS products is outstanding. Sometimes a handheld solution gets the job done better! 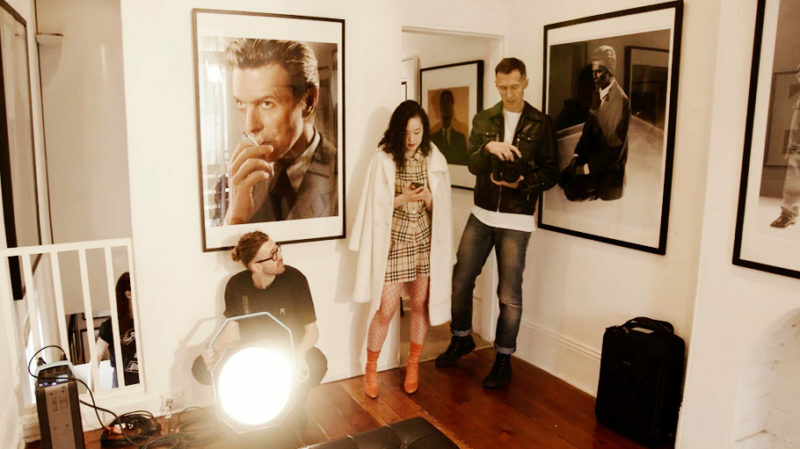 Behind the scenes of a lingerie shoot at Blender Gallery, Sydney during my David Bowie Unseen exhibit. A Broncolor Flooter needed to be angled from floor level up, so we decided to forgo any stands, and keep things moving. When selecting which stand or rig is right for the job, keep in mind that bigger is not always better, but of course if in doubt, it certainly is a lot safer to use a slightly beefier stand than needed, rather than risking catastrophic consequences of a crashing rig!